A true warrior in miniature. Expressive and attention to det .. Experience in the Greco-Persian wars demonstrated the effectiveness of light infantry armed with light javelins, such as peltasts. Its name they got from the braided shield (Pelt), who had usually crescent-shaped and covered with goat or sheep skin, leather or canvas. Originally peltasts were residents of Thrace - areas in the northeast of the Balkan Peninsula, inhabited by pastoral tribes and extending until the Scythia. Tactics of peltasts was to scattered groups as close as possible to the enemy, throw darts at him and run away, avoiding the melee with the heavily armed hoplites. 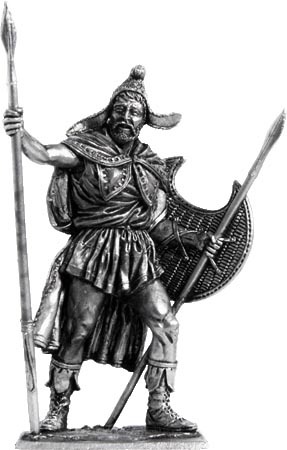 Thracian peltasts is characteristic of Phrygian cap of fox fur and high laced leather boots, comfortable for running on rocky, uneven terrain. A simple white tunic and a characteristic patterned cloak (Zeir) belted together to move freely and throw darts. Number of darts depended on their size. Shaft of one of them is equipped with a strap worn on the fingers to increase the range and effectiveness of the throw.